Things didn't play out so well the last time that shares were this high. 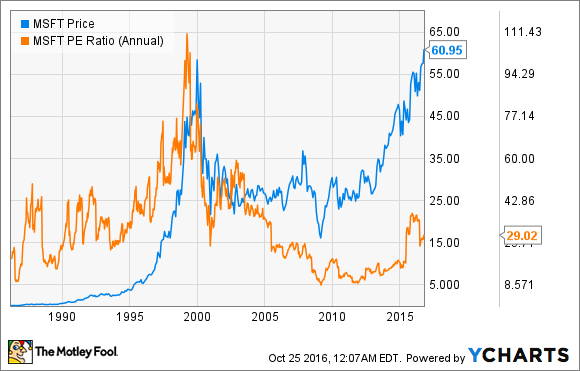 You could say that Microsoft (NASDAQ:MSFT) has reclaimed its "lost decade." You remember, that dark period of time under former CEO Steve Ballmer where shares languished for a decade as the software giant missed the boat on mobile, made hugely wasteful acquisitions, and lost the search wars. Of course, the context of that decade of underperformance that we can't ignore is that Microsoft was coming out of the tech bubble in 2000, which had just collapsed as investors realized that maybe they had gotten a little too ahead of themselves with this whole internet thing. That's not to say that investors were left completely empty-handed -- Microsoft paid out billions upon billions of dollars in dividends. It was just the share price that was stagnant. In the wake of a strong fiscal first-quarter earnings release, Microsoft has now jumped to hit fresh all-time highs not seen since the bubble popped 16 years ago. It's different this time. The first time around, Microsoft was caught up in the "irrational exuberance" of the dot-com boom, and it wasn't the only company that was sporting an unsustainable valuation at the time. It's easy to recall household names like Pets.com, but even Microsoft was not immune to getting caught up in the action. Shares traded at over 110 times earnings before things came crashing down. But these days, shares now trade at a much more comfortable 29 times earnings, which shows that the business has finally caught up to the 2000 stock price in terms of fundamentals. CEO Satya Nadella has ushered in a new era of investor optimism as he executes quite well across a number of different verticals. There's been some multiple expansion under Nadella, a sign that investors believe in his future visions and have confidence in his leadership. There is a caveat, however. As most investors know, share price is a somewhat arbitrary number. 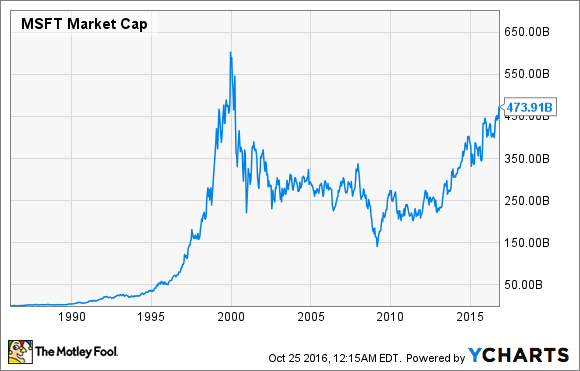 So while Microsoft's share price has now reclaimed 2000 levels (adjusted for splits), and the earnings are finally there to back it up, Microsoft's market cap is still meaningfully less than it was back then. The company had set a market cap record of $618.9 billion in 1999, which was only recently (and briefly) surpassed by a rival from Cupertino. The software giant's valuation is now around $475 billion. This is due to the fact that Microsoft has repurchased quite a few shares since then as part of its capital return program, reducing the number of outstanding shares that market cap is calculated from. Still, despite that qualifier, Microsoft's recent run in the years since Nadella became CEO have made up for lost time.